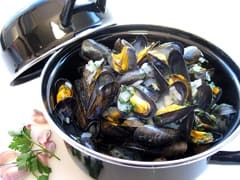 Before starting this Moules Marinière recipe, make sure you have organised all the necessary ingredients. Give the mussels a good scrub. Wash them thoroughly 2 or 3 times, then drain. Reserve in the fridge. ... and chop the parsley. In a large pot, place the drained mussels.